But the most important thing is we just need to get Beckman out of there. This is the worst coaching job I’ve ever seen. It’s one thing to have a bad season — good coaches sometimes have bad seasons. What Beckman is doing is stunning. He can’t even compete, can’t even keep it close, against anyone in the Big Ten. You’re probably confused about that last one. Maybe you’re thinking “Wait, Todd Monken? The coach of the currently 0-7 Southern Miss Golden Eagles? Who just lost to North Texas 55-14?” Yes, that guy. He was a favorite during the last Illinois coaching search because of his Illinois roots and the prospect that he could possibly bring then-Oklahoma State QB Wes Lunt with him. Now, even though Wes Lunt is already on the Illinois football team, people are resurfacing his name, because….internet, I guess. At this point, surely you’re thinking “Matt, that’s just a random cross section of message board knee-jerking! That happens after every game!” and you’d be right. But then former Illini Ken Dilger threw out a (now deleted) “Fire Beckman” tweet. And then I look at the schedule and see what will likely be a humbling, nationally televised loss at Penn State next week. And then a probably shootout loss at Indiana, a demoralizing occurrence under any circumstances. And then Carlos Hyde has a legitimate shot at breaking the single game NCAA rushing record (I’ll save you the trouble – it’s 406 yards, by LaDainian Tomlinson). It’s easy to see how things could escalate in a fairly straight, unbroken line. So even if this sentiment isn’t reaching critical mass right now, it probably will before Thanksgiving. And I get it. It’s a frustrating time to be an Illinois football fan. And like most instances of a coach on a hot seat, there will be people asking “Why wait?” or “What’s the risk in firing a guy after two years? It can’t get worse. What do we have to lose?” These people need to look about 430 miles to the west of Champaign. Like Ron Zook, Mark Mangino walked into a pretty bad situation. The Illinois program Zook inherited had won the Big Ten four years earlier, but it had pretty much imploded by 2005. 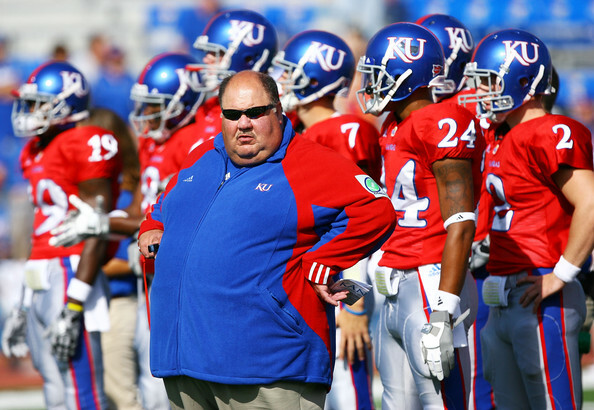 When Mangino took over at Kansas, they hadn’t had a winning season in 6 years. Both turned things around in relatively short order – two seasons after Mangino was hired, in 2003, the Jayhawks were bowling. Two seasons after Zook was hired, in 2007, the Illini went to the Rose Bowl. That same year, Mangino took Kansas to the Orange Bowl (yes, this happened! Kansas won a BCS game). Both then went off the rails shortly thereafter in seasons that saw complete collapses, with Mangino’s 2009 team losing their final seven games, and Zook’s 2011 team finishing 0-6 after a 6-0 start. In 2009, Kansas hired Turner Gill to replace Mangino. In 2011, Illinois hired Tim Beckman. By any measure at all, Gill’s debut season was better than Beckman’s – KU beat a top 15 team (Georgia Tech) and beat a conference opponent (Colorado) after trailing 45-17 in the fourth quarter (!). The most notable event of Beckman’s 2012 campaign involved chewing tobacco. In season two, Gill started 2-0, but then faceplanted with ten straight losses. Kansas had apparently seen enough, firing him following the season. I’m not a sadist or anything, so I didn’t watch a lot of Gill Era Kansas football, but perusing the 2011 results, there are some competitive losses (31-30 in OT to Baylor, 13-10 to Iowa State, 46-35 to Texas Tech, and 24-10 to Missouri). I remember that, statistically, this team was woeful, but it actually looks like it was more consistently competitive in conference play even though it was -1 in the Big 12 win column. So if you’re following, this is where Illinois would be at the end of the season. Two years in, with some improvement being shown (regardless of how the rest of the 2013 Illinois campaign plays out, it’s already been an improvement over last year). When it found itself in this spot, Kansas, thinking “This can’t get any worse,” axed Gill and hired Charlie Weis. This was apparently based on the ironclad logic that what was preventing him from succeeding at Notre Dame must have been the cornucopia of unique, built-in advantages that program has. A true schematic artist needs a blank canvas to realize his vision, right? How’s that working out? Well, there’s currently one program with a longer conference losing streak than Illinois – it’s Kansas. Now, the moral of this story isn’t Tim Beckman = Turner Gill. It’s that when Kansas canned Gill and went out looking for their third coach since 2009, they were forced to roll the dice with a retread, and from the looks of it, they lost that gamble. So Illini fans had better be damn certain that Beckman can’t succeed before they start thinking that a move is warranted after two years. And if the tangible improvements on offense and special teams (not to mention the aforementioned Wes Lunt) aren’t enough to give them pause, the potential to make the Illinois football job even less desirable should be.